1. Preheat the oven to 200°C, gas mark 6. Cover the raisins with warm water and set aside. Toss together the sprouts, olive oil and saffron, then transfer to a baking sheet. Season, cover with foil and roast for 15 minutes. 2. Remove the foil and roast for another 10 minutes. 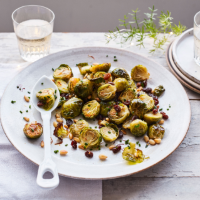 Drain the raisins and stir into the sprouts along with the pine nuts, then cook for a further 5 minutes, until tender and golden brown. Stir in the chives and serve.